Many people can take great photos, but few know how to effectively post-process them to achieve their artistic vision. Use our post-processing services to elevate your photography to the next level! Lightroom and Photoshop Training: We work on your images and teach you the best post-processing methods. Sessions can be done remotely via Skype or in-person if in the local area. $99/hr for the first two hours and $75/hr for 3+ hours. Image Editing Service: Don't have the time right now to learn post-processing? Just send us your RAW files and we will edit them to perfection and return them as ready-to-print files! Prices start at $50/image for basic editing. More complicated edits like focus stacks, panoramics, and Milky Way images start at $100/image. Full Service Package: We process your RAW files using a meticulous fine-art workflow. From there, we'll get them printed and framed according to your preferences and deliver the finished pieces right to your door. We guarantee the best possible quality for your art! Contact Us for a price quote. Lightroom & Photoshop skills for landscape photography from basic up to very advanced! Everything you need to know about layers, layer masking, and blend modes. Learn how to combine and blend exposures. How to sharpen an image and the correct sequence for doing so. How to perform non-destructive localized dodging and burning. This is where you really get to become the artist! 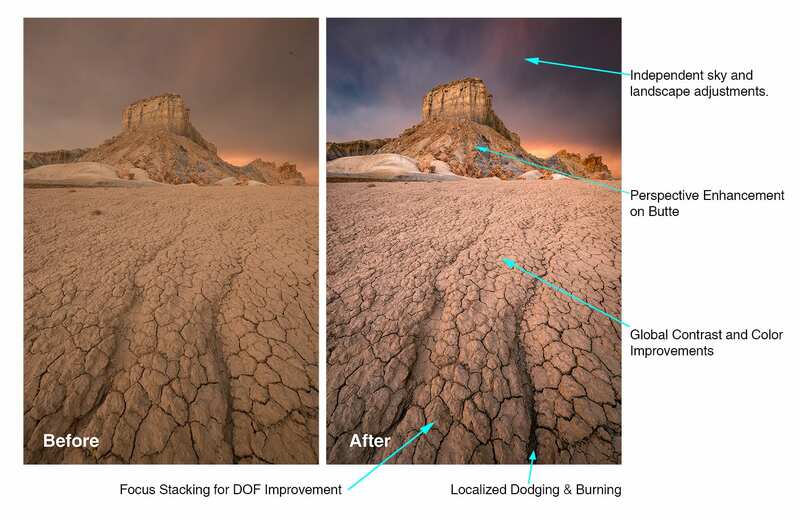 Learn what luminosity masks are and how they can be employed for a variety of creative purposes. How to combine focus-stacked images for improved Depth of Field. Advanced Techniques like Orton Effects, perspective blending, night photo editing, removing flare, and much more!! Night photos are some of the most difficult images to post-process. Let us show you our best tips and tricks to really make your Milky Way and Star Trail shots pop! Learn the basic RAW adjustments needed on night photos. There are some sliders in Lightroom you need to be really careful of! 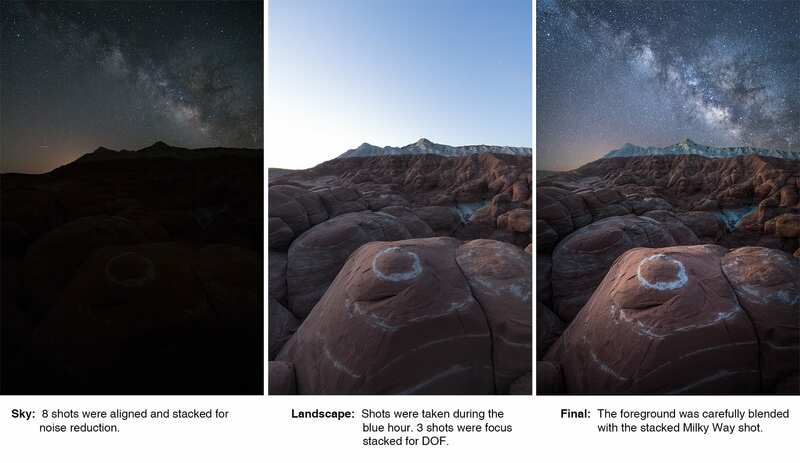 Learn how to align and stack sky images for noise reduction and how to deal with problems like increased vignetting and contrast loss. We'll cover various techniques for selecting the sky independent from the landscape for combining with lower ISO foreground shots. Create night panoramic images and learn how to blend natural light shots convincingly with the starry night sky.